To take the following of the F-16 FA-131 (Réf : Syhart 081), the FA-134 received a new scheme on 2009 to be the new Belgian demonstrator. 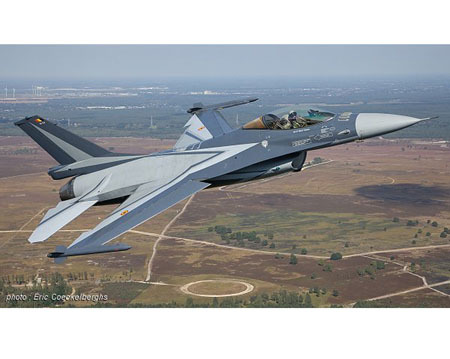 Flown by Cdt "Mitch" Beulen from the 349th Fighter Squadron based on Kleine-Brogel, like on previous aircraft, it had be used during usual operations between airshows seasons, so the scheme had to be painted with the standard F-16 colors. Although the simple scheme on first look, and painted with only grey tones, the design is more developped than it look, colors are inverted on top/bottom (it is dark grey on bottom, where it's light grey on top). Finally, this aircraft appear with this scheme during the season 2009 only, followed by the FA-110 "Vortex" on 2010-2011.